With the biopharmaceutical industry’s drug delivery landscape quickly adapting to the introduction of several biologics drugs in recent years, a range of new devices such as pen and auto injectors have also been introduced to improve administration, safety and accuracy for end-users. As biopharmaceutical companies and device manufacturers come together to work on developing innovative solutions at conferences and related events, it is becoming apparent that for a device project to succeed, it is crucial to find a partner that can provide a number of essential services. 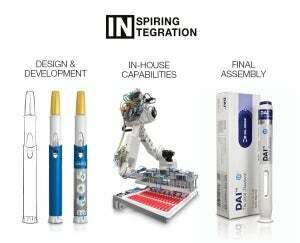 To promote the importance of integrating such services in the areas of development, capabilities and final assembly for drug delivery devices, SHL will focus on the company’s internal theme of ‘Inspiring Integration’ while exhibiting at PDA’s 2012 – The Universe of Pre-filled Syringes & Injection Devices in Las Vegas, USA at the Red Rock Resort from 15 – 16 October. The theme for this year’s PDA event in Vegas is ‘Integrating the Unmet Market Needs: Bringing it All Together for Tomorrow’s Success’. SHL believes that this fits well with requests highlighted at recent events, where we continue to see device partners needing to expand on the range of services that they provide to their customers. Even as some of the world’s larger biopharmaceutical companies have continued to develop extensive device knowledge over the years, several companies have still never had the opportunity to work on an auto injector project. In both cases, the importance of working with a partner that can provide a range of key services and capabilities needed to streamline all stages of a project and help to enhance speed-to-market is vital. Experienced device suppliers will now be relied upon even more to share the knowledge they have gained. For this reason, SHL will be sending a large number of staff to this event with diverse backgrounds, including specialists in product design, product management, final assembly, packaging and more. These staff will be attending the conference and be available for private meetings. Marketing Director Steven Kaufman commented on the upcoming event saying; "The Universe of Pre-filled Syringes & Injection Devices Conference held by the PDA annually is an event that we like to be involved with. Over the years the PDA has attracted various industry experts to speak, attend and exhibit at this event, this allows device companies like ourselves to interact with key individuals to better understand the unmet needs of biopharmaceutical companies and learn what we can do to provide our expertise and services. "Although we have a number of new devices in our pipeline, this year we decided to focus on the importance of integrating design and development, in-house capabilities and final assembly and streamlining them for customers so we can maximise efficiency and quality. That said, we of course welcome attendees to ask about our latest devices." If you’re attending the 2012 PDA, come speak with one of SHL’s experienced staff at booth #103.